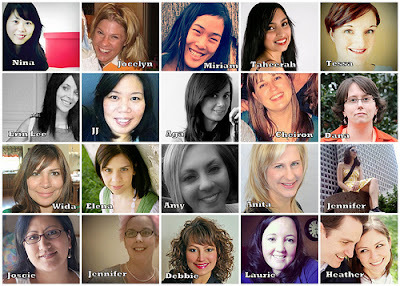 Last Friday, I got unbelievable news that I was one of the Top 20 finalists for the Paper Crafts Gallery Idol 2012! (Have no idea what I'm talking about? Check out the Paper Crafts blog for more info) First came a rush of giddiness (squeee!) quickly followed by a wave of panic (oh...em...gee...). 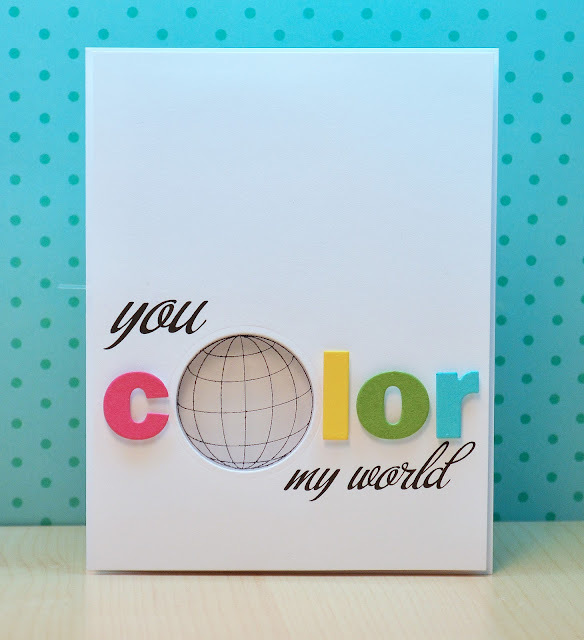 After some deep breathing and a little chocolate, I turned my attention to the Round 2 theme, You Color My World! I had already done this card and this card for the open audition round, so I was feeling a bit tapped out. So this weekend, I brainstormed, I sketched, I browsed a billion Pinterest images....only to end up doing what I usually do. I winged it! Here's what I came up with! It's sprinkling sprinkles! I know I always say this, but this card is easier to make than it looks! This card is basically just a modified version of a shaker card. Instead of one visible well, you have one visible and one hidden! 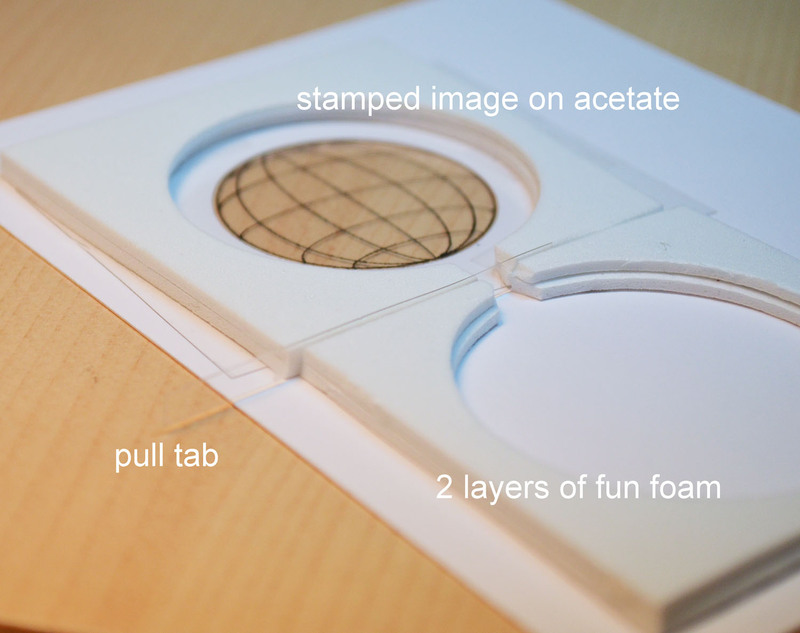 The wells are super easy to make using fun foam (double up on the layers). For added fun, put a small piece of acetate between the wells to create a pull tab. 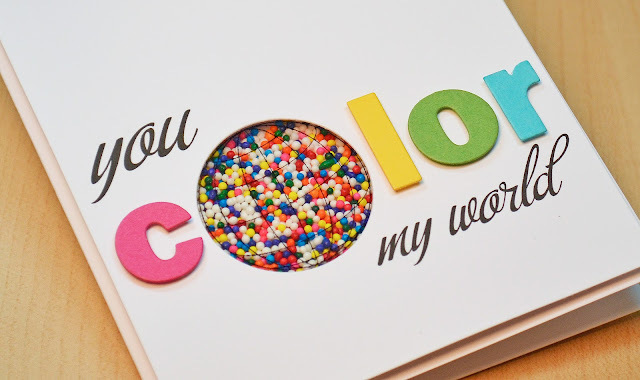 I chose sprinkles for their color and weight, but colored sand and beads are also good choices. The possibilities make me giddy! The beauty of this card is that even after the pull tab is gone, just flip the card over, allow the sprinkles to fall back into the reservoir, and start the fun again! Before I sign off, I just want to express how thankful I am that you stopped by! Your visits and kind words really mean so much! I encourage everyone to visit all the Top 20 blogs and put in your vote HERE (even if it's not for me:)! And regardless whether I advance to the next round, I feel *so* lucky to have had this experience and to have met such wonderful and talented designers! Just look at these ladies! How can you not be inspired by this bunch? JJ this card is total genius!! Blown away by it completely, so so clever!! JJ, that's is genius! Fun and super creative!! Absolutely super fun! I love the pouring sprinkles! And oh, yes...that gut wrenching kind of fun! HAHAHA! even more amazing when you see the step by step photos! an hour-glass-shaker card! Seriously? This is genius! I love it! Awesome card, JJ. Way to go. Of course you are a finalist! This is an incredible card--you are so creative to think of it. I love how those sprinkles fall. Wow, so amazing! I love your card! So much fun I just die!! Amazing. You are so incredibly creative! Oh my! This is so imaginative! Love it! JJ you did a FABULOUS job, and I just love the action shots! 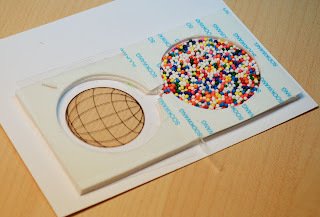 Absolutely a fantastic shaker--I love everything about your card but especially the rainbow of sprinkles. absolutely creative...I love those sprinkles! Your cards always blow me away!! WOW! What a great card. Your idea is genius and your execution is perfect. And thank you for always sharing your techniques. I learn SO MUCH from you. wow, so inspired! Can't believe how cool the sprinkles look!!! Fab card! WOW!! Always new amazing designs JJ!!! I'm so impressed I don't have words! A vote from me definately! Brilliant and so damn genius! Congratulations on making the top 20! Absolutely amazing entry.You are super genius. What a brilliant interactive element! I just love it. Good luck in this round. Fantastic!!!! You are my IDOL! Wow this is so ingenious! Oh my! This card is incredibly creative!!!!!!!!!! can you send some of your voters my way. I KNOW you will have plenty to spare!!! I love your genius card! ohmygosh. I didn't realize it was like an hourglass! and I love it even more. so awesome. Such a clever design, love it! Such a creative and clever design That has a big WOW factor for sure! Purely amazing! I didn’t even finish reading this is the most amazing card and talk about crerative….. how do you come up with this…… Stunning ! I almost did not see the tab sooo darn perfect,JJ off to vote! this design is amazing! Can't get over your concept and design. What a fantastic idea! I love it! So fun and clever! JJ, your cards are fantastic and this one is no exception! I think you're really talented and very much deserve your place in the Gallery Idol 20. Big congrats & good luck - ill be watching how you get on !! JJ this is fabulous! Totally amazing! You are so creative! This is seriously incredible, JJ! I'm not at all surprised to see you in the Top 20, and I predict you'll go far! Love this colorful and interactive card. Good luck in this round! This is AMAZING! Such a creative card. Oh wow, how amazing is this?! Just fabulous JJ, I don't know how you come up with these ideas, but they are magnificent! Congratulations on getting to the Top 20! I am not surprised, so well deserved! This is a super, super, super cool card!! You're such a genius! OK, first, let me say I was not at all surprised to see you in the finalists. You totally rock. Second, I just loved the first photo of your card and thought that was it. Very fresh and clean. Third, I was BLOWN AWAY with the pull tabby thing. And sprinkles?! I need to shop in my kitchen cabinet more often. Would have never thought of that. The two reservoirs idea is genius. Genius, I tell you!!! OMG!!! This is AWESOME! The stress of having to come up with another fantastic card had to be horrible - but now that you have it done I hope you are sitting back and smiling! This is too cool - another ' hey everybody come look at this card JJ made!!!! ' Just brilliant JJ! I don't know how you did it but - this is crazy good! GO YOU!!! There goes my jaw again, clunking to the ground! LOL! This is genius, JJ! So much fun and so colourful. You ROCK!!!! Genius! You never cease to amaze me with your super creative designs. Wow! What an awesome card!! This is ROCKIN'cool. We love how you used our stamp from our ZipNBy to Say Hi set in your project. AWESOME project, JJ. Holy cow, this is ingenious, JJ! You are so clever and your card looks AMAZING!! So glad to be in this crazy Top 20 ride with you! What a Fabulous Card! Congrats on making the top 20.
this is so beautifully made and clever!! You are my papercrafts idol for sure. This is off the charts AMAZING!! I am floored! Wonderful wonderful! Fantastically creative! AWESOME! !!!!!!!!!!!!!!!!!!!! I am I M P R E S S E D !!!!!!!!!!!!!! Dang, JJ, you are a genius!! What an idea!!!! Mahalo!! wow, i'm so glad i read about your card. way better than just the first pick. so cute. good luck. such a clever idea. Very creative, fun, awesome card! Love it!!! HOLY!!! Sprinkles. this is amazing! Wow! What an awesome DIY project!! Word of the Day: THANKS!